Over the last few quarters, Android tablets have overtaken the iPad's quarterly shipments thanks to strong vendor performance across all tiers. However, many analysts consider this meaningless because the iPad supposedly dominates tablet usage, i.e. browsing share as measured by various research firms. Let's take a look at the problems with existing data on the subject and look at another data source that measures more relevant data. Using this data, we can assess the browsing share of Android tablets by region and project future performance. 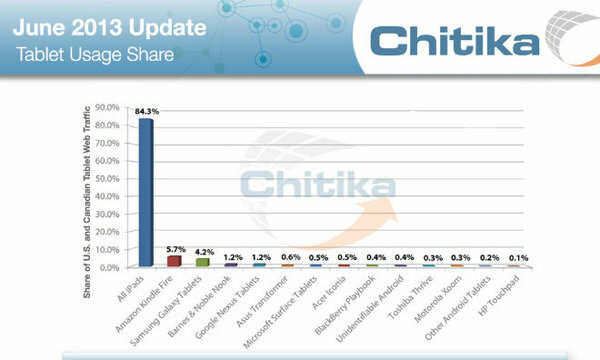 The most quoted figure on tablet browsing share is from Chitika. While Chitika's website sample size (300,000 websites) seems sufficiently large, it only measures North American traffic. Therefore, comparing tablet browsing share results from North America to global tablet shipments is bound to be flawed. The other alternative is NetApplications, which doesn't measure tablet browsing share per se, but measures browsing share by mobile platform. The problem here is the small sample size (40,000 websites) and the fact that browsing data is weighted by CIA's Internet Traffic by Country table. While weighting methodology itself may not be flawed, there is no way to assess the popularity of the sites in NetApplications sample in various regions around the world (especially considering the relatively small sample size). To solve these problems, we need a data source that measures tablet browsing share by region, with a large sample size. Interestingly, this data has been available for years, but has been ignored by analysts and the tech media. Statcounter Global Stats measures browsing share by region with a sample size of over 3 million websites. Unfortunately, it was assumed that Statcounter just measured smartphone market share. In response to an inquiry from me, Statcounter reps confirmed that they did measure tablet browsing share, but that it was included in desktops for now. Because of the size of the PC install base, tablet browsing data would just show up as a small blip in desktop stats. However, after downloading the data, I could isolate the tablet browsing performance of Android devices and the iPad. Because of my methodology, I could only measure the relative browsing performance of Android tablets vs. the iPad. I had to ignore all data in the "other" category as it could have been contaminated with older PC operating systems. In any case, this should not present a problem given the abysmal shipment figures of all non-Android and non-iPad tablets. As a sanity check, I compared browsing data from North America with Chitika's findings and they seem consistent. To me, the interesting part is the browsing performance in other regions and the overall trend. 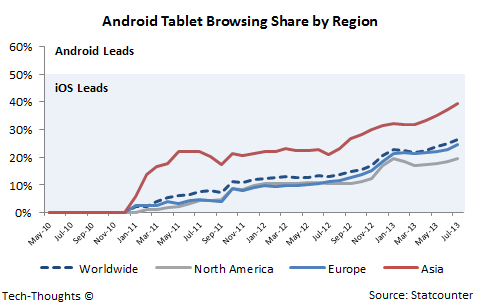 Android tablets browsing share is still relatively low in Europe, but very strong in Asia. 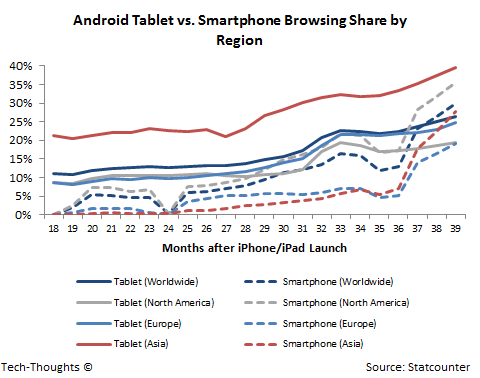 Despite the iPad's head start in the market, Android's tablet browsing share has nearly matched the iPad in Asia. More importantly, the overall trend is sharply in favor of Android tablets, which supports the strong shipment performance over the past few quarters. Before we attempt to project Android tablets' browsing share, we need to understand the shift in smartphone browsing patterns over the last few years. For consistency, the methodology followed here is the same, i.e. Android vs. iOS browsing share. As we can see, Android smartphones saw explosive growth starting mid-2010 across all regions. The spike in browsing share was most pronounced in Asia, but other regions saw strong growth as well. 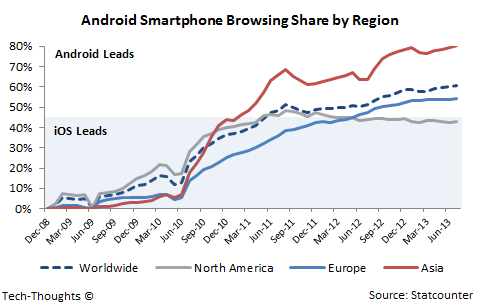 In fact, by mid-2012, Android smartphones had overtaken the iPhone's browsing share globally, driven by Europe and Asia. Since mid-2011, the US has been the lone exception for reasons I have already covered extensively, i.e. the iPhone contract pricing model ($99 iPhone 4S and "free" iPhone 4). Now, we need to compare this browsing share pattern with that for Android tablets at the same point, i.e. since the iPhone/iPad launch based on product category. In the chart above, Android tablet browsing share is represented by solid lines while smartphone browsing share is represented by dotted lines. Since Statcounter only showed data from December 2008, we only have access to smartphone browsing data 18 months after the iPhone launch. The pattern clearly shows that Android tablets' browsing performance has been far better than Android smartphones at the same point in time in all regions except the US market. As before, Android tablet browsing share is trending upwards and as products continue to improve, Android tablet usage should continue to gain steam. The data above is interesting because, as we saw in smartphones, Android tablet browsing share in Asia is beginning to sharply trend upwards. It will be very interesting to watch how this pattern evolves over the next few quarters.